Kathy came to me in a rough place. She could only “safely” eat a few very simple carbs and a little bit of dairy—things like quesadillas—so she could avoid the cramps, bloating, constipation, stomach pain, heartburn, the list goes on. Basically, she wasn’t able to digest most foods due to some breakdown in the digestion process. Suspecting insufficient stomach acid, I tested to see if her stomach could use a stomach acid supplement to start the cascade of steps in the digestion process. Not surprising, she tested well for the supplement. After taking betaine hydrochloride for a few weeks, she was able to eat foods with no digestive issues, foods she hadn’t been able to eat in years—things as simple as steak, broccoli, chicken, fish, carrots. Now she can eat a wide variety of foods and her body can make use of the nutrients. Hypochlorhydria, the condition of not having sufficient stomach acid, is incredibly common and overlooked these days, including among those who eat a very healthy diet. In fact, a “large portion” of people over the age of 60 have insufficient stomach acid (source). It can occur among adults and children. Sufficient stomach acid is critical not only for proper digestion but also for health in general. In the first article in this series on digestion, So you have some digestion problems—what’s the big deal?, we explained the digestion cascade—how eating in a relaxed state without any internal stressors, chewing food properly and having sufficient stomach acid is necessary for the rest of digestion to occur. Without enough stomach acid, the food is not acidic enough to give the signal to be able to enter the small intestine. Proteins putrefy, fats rancidify and carbohydrates ferment starting in the stomach. The food that is eventually allowed to pass into the small intestines is not acidic enough to trigger the release of digestive enzymes and bile needed to further digest the food. Undigested food disrupts the balance of gut flora in the small and large intestines and can cause leaky gut in the small intestine. Leaky gut can eventually lead to many health problems within and outside the small and large intestines, including autoimmune disease and neurological issues, such as autism and ADD/ADHS, mental illness, and food allergies. Many studies have shown that people with insufficient stomach acid are particularly at risk of a wide range of illnesses, including childhood asthma, stomach cancer, skin conditions, including acne and eczema, osteoporosis and Type 1 diabetes (Wright and Lenard, 41), small intestinal bacterial overgrowth (SIBO) and H. Pylori infection. Without sufficient stomach acid, many vital nutrients cannot be broken down and absorbed, including proteins, iron, copper, zinc, calcium, magnesium, and folic acid, and B-complex vitamins (Lipski 223). Without enough stomach acid, pathogens in our food cannot be killed, increasing the risk of food poisoning. Also bacteria that enter through our nose and mouth are not killed, and are allowed to enter the intestines. Acid reflux happens when the sphincter between the esophagus and the stomach opens when it’s not supposed to, allowing the acidic food in the stomach back up the esophagus, causing a burning sensation, called heartburn. Scientists do not know for sure why this sphincter opens and allows food from the stomach back up into the esophagus. One hypothesis is that the low pH of stomach from sufficient stomach acid makes the sphincter close so as to not allow acidic food up into the esophagus (Wright and Lenard). When there is not enough stomach acid to make the stomach environment and food acidic enough, the sphincter doesn’t close. Another theory is that pathogens in the stomach (not killed by sufficient stomach acid and which can also reduce stomach acid production) and the toxins they produce partially paralyze the sphincter, keeping it open (Campbell-McBride, 287, 291). Though the food is not as acidic as it’s supposed to be, it’s acidic enough to cause the burning sensation in the esophagus. In a minority of cases the sphincter opens up at the wrong time due to a structural misalignment issue, which would require chiropractic adjustment. Though we can’t be certain what causes that valve to open when it shouldn’t, it is generally accepted in the functional medical community that it is caused by too little stomach acid. What we do know for sure is that taking stomach acid supplement stops the heartburn, as well as eliminates many other symptoms. On the other hand, the use of acid neutralizing and acid blocking drugs to counteract heartburn do not cure acid reflux, but offer temporary relief and further deplete stomach acid. For more information on treating acid reflux and GERD, we highly recommend the book Why Stomach Acid is Good for You: Natural Relief from Heartburn, Indigestion, Reflux & GERD by Jonathan V. Wright and Lane Lenard. First of all, one must address the root cause of low stomach acid. (See list of causes above). See a nutritional therapist or functional medicine health care practitioner to address the cause of low stomach acid. While the root cause is being addressed, there are several things you can do to ensure you have enough stomach acid. Relax as much as possible before eating. Drink 1 tablespoon of raw apple cider vinegar (ideal) or lemon/lime juice in 6 ounces of water 10 minutes before eating. If you forget, you can take it during or soon after eating too. This stimulates the stomach to make its own stomach acid and supports other aspects of digestion. If this causes painful burning don’t try this again – your stomach lining most likely will need some healing before continuing down this path. Only under the supervision of a health care practitioner, take supplement of betaine hydrochloride and pepsin. This is a replacement of stomach acid. Bray, GW., The Hypochlorhydria of Asthma in Childhood, Quarterly Journal of Medicine, January 1931; 24: 181-197. Campbell-McBride, Natasha. Gut and Psychology Syndrome. United Kingdom: Medinform Publishing, 2004. Wright, Jonathan V., and Lenard, Lane. 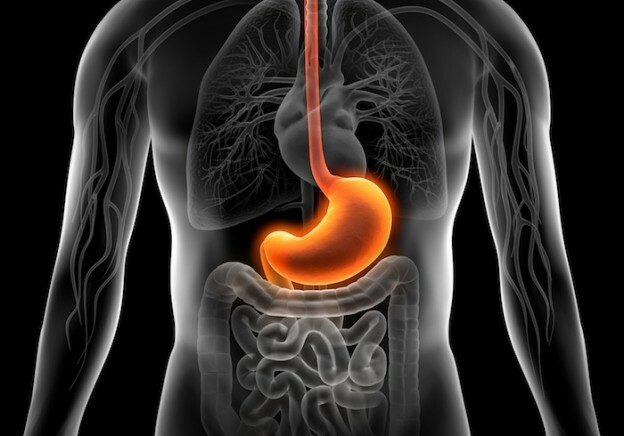 Why Stomach Acid is Good for You: Natural Relief from Heartburn, Indigestion, Reflux & GERD. This post was co-authored by Thomas Gilliford, Nutritional Therapy Practitioner, Certified Rolfer™. Thomas has a private practice in Denver and Boulder.